Health care services often become severely disrupted in conflict situations. Lack of coordination, overcrowding, security constraints, and competing priorities can contribute to an even greater decrease in available and accessible health services, especially for women and children. However, where health services are functioning, health care providers can play an important role in prevention as well. Initiate community dialogues to raise awareness of the issues and can collaborate with existing efforts on behaviour change communication and information/education exchange. Relay information to women who are seeking other key services, such as reproductive health and HIV services. Ensure men also receive information on violence against women and its detrimental effects on the health of the woman, children, family and community. Identify and mobilize existing resources in the community (women’s groups, traditional birth attendants, gender-sensitive religious leaders and other community service providers to increase awareness. Refer or link women who are at risk of violence to safe places/shelters and other resources. Ensure they follow ethical standards and codes of conduct and treat women and girls with respect. Ensuring women, men, boys, and girls participate equally in all steps of the project; Consult women, adolescent girls and boys, and men at all steps in the project design, implementation and monitoring. Making sure that women, adolescent girls and boys, and men can access health services equally, including priority RH services of the Minimum Initial Service Package (MISP) at the onset of an emergency and to comprehensive RH as the situation stabilises. Designing services to meet the needs of women, men, boys, and girls equally by ensuring that Community Health Worker teams are gender-balanced. 5. Analysing the impact of the crisis on women, girls, boys and men and what this entails in terms of division of labour, workload, and access to health care services and facilities. Sources: Adapted from the IASC GBV Guidelines (p. 63-66) and GBV AoR tip sheet on Health; and the ensuring gender-equal programming checklist on page 80-81 of the Gender Handbook in Humanitarian Action, Inter-Agency Standing Committee, 2006. See the health cluster website. 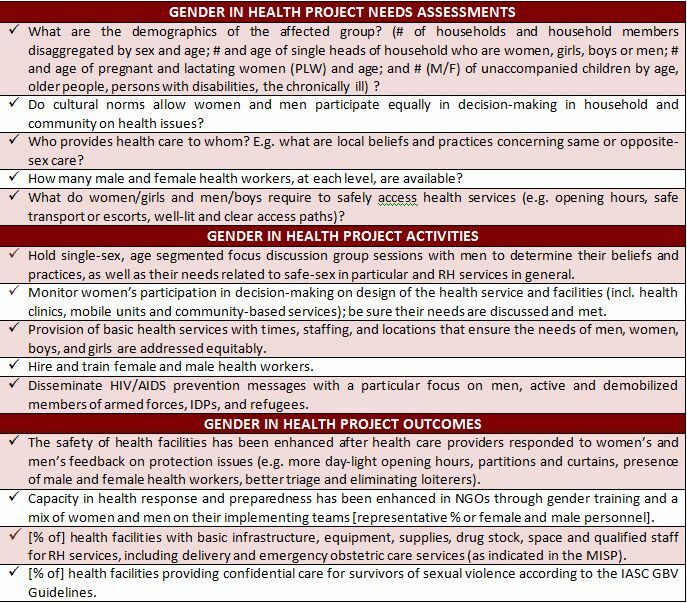 For more information on the responsibilities of the Health sector in addressing VAWG in humanitarian settings, see Health Response in Section VII, as well as the Health Module.